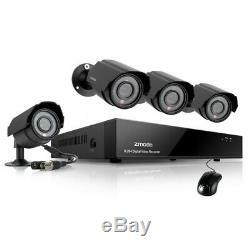 Zmodo 4 Channel Complete Security Solution with 4 600TVL Hi-Resolution Night Vision Indoor Outdoor Cameras and Free Mobile Apps. Developed and designed for the needs of numerous end-users, this advanced 4 channel surveillance system has improved camera resolution to 600TVL, while still being affordable. This Zmodo Series Security Solution allows you to maintain your busy lifestyle while enjoying peace of mind knowing that your home, family, business or employees are safe and secure. This advanced 4 channel complete security solution with 4 hi-resolution (600 TVL) night vision cameras that is fully controllable on your Smartphone, Tablet or PC. All Zmodo DVRs come with our free Smartphone App called "Zviewer". This free Apple (iOS) and Android accessible application allows you to access your camera footage any time from anywhere in the world. You can now remotely monitor your property 24/7 worldwide from your smartphone. (Control Mnagement Software) for PC. All Zmodo DVRs are accessible over the internet via PC computers using the Camera Management Software downloadable from the product page. Gain peace of mind knowing that your property and loved ones are safe and sound. We offer a FREE DDNS service to our customers. If you register with a DDNS service, you get to use a host name of your choosing instead of an IP address, and the DDNS service will update the IP address that is linked to your host name when your IP address changes. 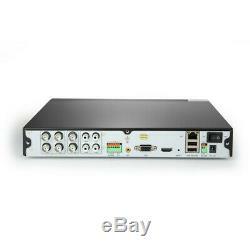 Professional Digital Video Recorder (DVR). 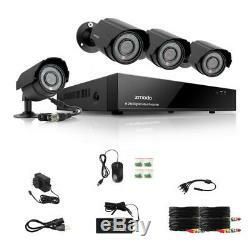 264 D1 Real-time Security DVR. Maintain vigilance and experience true peace of mind with the Zmodo 4-channel security DVR. It can record up to four cameras simultaneously in D1 (704 x 480 pixels) resolution at 30 frames per second. Featuring the innovative network connectivity, it allows you to quickly and easily connect to your smartphone, tablet or PC from anywhere, anytime. The enhanced motion detection settings ensure only true motion triggers the alarm. The motion detection mask easily allows you to block out areas with constant movement, such as roads or trees. Easy Connection to your TV or Monitor. With equipped 1 BNC and 1 VGA video output, you can easily connect the DVR to your TV or monitor for instant viewing. View all cameras at once on a split-screen, or view 1 camera at a time on full screen with the option to cycle through each of the cameras at a customizable speed. 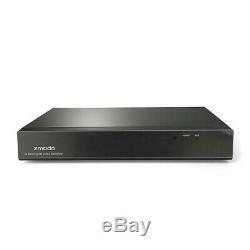 The DVR can be set to continuous recording, time scheduled recording and motion triggered recording. Each individual camera can have a unique settings. Easily find and playback your security footage by searching a specific channel using date or time, or all 4 channels simultaneously. This DVR comes equipped with a state of the art, easy to use icon based interface. The interface is very user friendly and comes equipped with both a USB mouse. View all cameras at once on a split-screen, or view 1 camera at a time on full screen mode with the option to cycle through each of the cameras at a customizable speed. The DVR is designed to be pentaplex, allowing five actions simultaneously. Live view, record, playback, backup files and remotely monitor and manage your DVR on your computer through the network without any recording loss. Transfer video files from the surveillance system to a PC, Flash Drive or USB Hard Drive in order to free-up space for new video while retaining important footage. Four 600TVL high resolution bullet security cameras offer improved sharpness, clarity and detail under all light conditions, and capture detailed video footage all of the time. 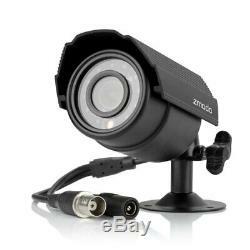 Weatherproof Cameras for Indoor/Outdoor Use. Each camera comes equipped with professional-grade aluminium housing and hoods making the camera weather resistant. Adjustable wall mounts allow installation at almost any angle, giving you the best view of the areas you want to observe. These cameras are well equipped to handle indoor or outdoor conditions. Each camera comes equipped with 11 LEDs allowing the ability to view images up to 50ft away at night, protecting your family or business at any hour of the day. See further distance area with the 6mm lens Cameras which is a perfect balance between angle and distance to protect larger areas such as driveways, entrances, warehouses, large retail stores, parking lots, front and backyards. Professional Installation Services Provided Nationwide. This kit comes packaged with all the cables and accessories for DIY. We also offer installation services throughout the continental US via InstallerNet. 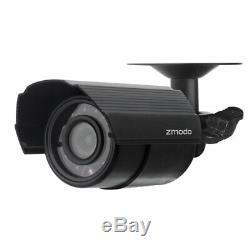 The item "Zmodo 960H 4CH DVR HD 4 600TVL Outdoor Home Camera Security System Night Vision" is in sale since Sunday, March 29, 2015. This item is in the category "Consumer Electronics\Surveillance & Smart Home Electronics\Home Surveillance\IP & Smart Security Camera Systems". The seller is "afdsolutions" and is located in Muskegon, Michigan.